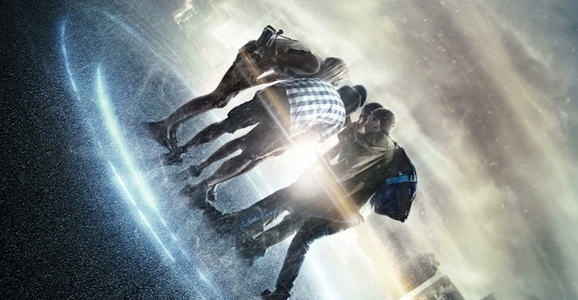 Expectations have not been high for Dean Israelite’s feature directorial debut, Project Almanac. The Michael Bay-produced, teen-centric, found footage time travel film, formerly titled Welcome to Yesterday, has been pushed back and delayed multiple times, ultimately dropped at the tail end of January, and beginning late last week there was even rapid scramble to excise a two-second clip from the movie and the promotional material—it featured footage of a real life plane crash, which incensed families of the casualties. The deck is certainly stacked against this one, but despite all of that, as well as being totally predictable, Project Almanac is actually a decent amount of fun. From word one, you know precisely where this movie is going. It doesn’t break any new ground, not even remotely, but what makes Project Almanac endearing is the self-awareness and earnestness of the characters. These are pop culture obsessed kids who watch Bill & Ted’s Excellent Adventure as a kind of time travel research and take their cues about what is and isn’t possible from Looper. And at a structural level, the plot actually plays out like a simplified version of Primer. The found footage flick Project Almanac, formerly titled Welcome to Yesterday and delayed a number of times, finally hits theaters this weekend, closing out the first month of 2015 with a bit of time travel. (Oddly enough, the month also started with a time travel joint, the Spierig Brothers’ under seen Predestination.) This teen-centric movie about a group of nerdy high school friends who discover that one of their dads made a time machine, got us thinking about our favorite young-folk themed time travel movies. With that in mind, here is a list of our favorite offerings in this realm, there are slackers, robots, and everyone’s favorite DeLorean. January closes out with the found footage time travel joint Project Almanac, and despite rushing to excise a controversial bit of footage from the film and trailers (it shows a real life plane crash that traumatized the families of some of the casualties), Paramount insists than the film will be ready for theaters a week from today, on January 30. Now in the final promotional push, the studio has released two new clips to give you a better idea of what to expect. The basic premise of the story is that a group of teenage friends discover one of their fathers created a time travel device. Being impetuous youngsters, they, of course, use this technology wisely and responsibly, by travelling back and doing things like wining the lottery, exacting revenge against those who have wronged them, and generally having a grand time. As you can imagine, after a honeymoon period, things take a dark and treacherous turn. You don’t generally expect a teen-centric, found footage, time travel movie to ruffle too many feathers, but the upcoming Project Almanac his managed to piss off the Air Force. One scene features footage of a plane crash that looks very similar to that of a 1994 B-52 crash, and the families of those killed in the accident have asked that Paramount remove the clip. In a scene featured in the Michael Bay-produced film, characters watch a news clip of a plane crash, presumably caused by their messing around with the timeline. According to the Air Force Times, the footage is “nearly identical” to that of a crash at Fairchild Air Force Base in Spokane, Washington which killed four officers. Now that it’s 2015, prepare yourself for an entire year’s worth of Back to the Future 2 jokes and people lamenting the fact that we don’t have hoverboards. But if you’re into time travel movies, you’re in luck, because January has a couple to choose from. The Spierig Brothers’ Predestination drops next week, and later this month, the found footage time jumping adventure Project Almanac opens, and that film just released a ton of new TV spots. The story follows a group of high school friends who discover that one’s father designed and built a time machine. Being impetuous teens, they use the newly discovered device to get up to all kinds of mischief. As with stories of this ilk, everything starts off all sunshine and puppy dogs, only to take a dark, serious turn as unforeseen consequences pile up around them. As an aesthetic choice, the found footage thing is hit and miss and will likely turn some viewers off, but if nothing else, story wise, Project Almanac at least seems like it’s trying to do something different. When you think found footage, the first thing that springs to mind is usually low-budget horror full of lots of running through the woods and jump scares. While that end makes up the bulk of the output in this aesthetic arena, there’s always been a notable overlap with science fiction. There’s Chronicle, Apollo 18, and Earth to Echo, among others, and the upcoming Project Almanac aims to take on a time travel story, bringing this new trailer back from the future. The Paramount Pictures release revolves around a group of super nerdy friends, which, if you didn’t figure that out right away, is driven home by the fact that one guy can’t hit on a girl and that they apparently sit around watching videos of one of their seventh birthday parties. What self-respecting teen does that? This geekiness helps them out, however, when they happen find the pieces of a time travel device and can figure out how to assemble the device.